When 10-year old Nico Mallozzi, a vibrant, popular, hockey-playing kid from New Canaan, Connecticut, died less than 72-hours after contracting flu last month, the story made the national news. And scared the crap out of parents all across the nation. The reason this particular boy’s death resonated so loudly was precisely because he was such a typical, normal, all-American kid—healthy in every way. Healthy in the same way that our kids are healthy, and by direct implication, if it happened to him then it could happen to one of ours. That’s why the story garnered so much attention, and why the media continues to inform us daily about the latest previously-healthy person dying from flu; from the 21-year old, body-building, Pennsylvania man to the marathon-running mom from California. The stories follow a pattern: previously healthy person becomes acutely ill, goes to the ER, is diagnosed with flu and discharged, then returns 12- to 18-hours later only to succumb to the virus in the ICU the following day. Beneath the surface of these stories lies a veiled implication that the deaths needn’t have happened, if only … If only the patient had been vaccinated, had been prescribed Tamiflu, or had been admitted sooner. But the truth is that there is likely nothing that could have been done (with the possible exception of prior vaccination) that would have saved any of them. It takes a perfect storm of cytokines and virus to kill a young healthy person so quickly, and the reason these stories are news is precisely because they’re rare and unpredictable. If Nico had died in a car accident, it would have been just as sudden and just as tragic, but it wouldn’t have been news. People are watching, and for the last two weeks numerous worried parents, after learning that their child has flu, have asked me, “What can I do to prevent my child from dying?” The fear is real, but not justified. What’s needed is a little perspective. This year’s vaccine is estimated to be between 10-40% effective against current flu strains, but remains the best way to protect yourself. It takes approximately 2 weeks for any immunity to occur. This year’s flu season has seen 53 pediatric deaths through the end of January. Pediatric deaths make up a small minority of the total fatalities. During the first 2 weeks of January alone, there were 1,679 total flu deaths reported. For perspective, the total number of all-cause deaths in the US over this same time was 86,140, meaning that even at the peak of flu season, the disease is still responsible for less than 2% of the total deaths in the US. 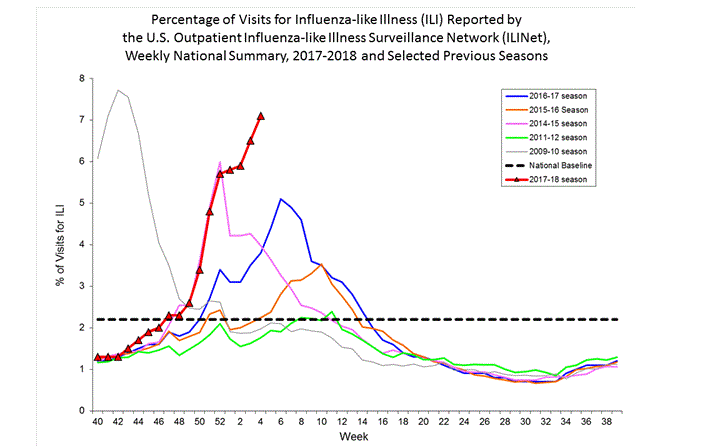 The overwhelming majority of flu victims recover uneventfully after a week to ten days. This year’s predominate strain is the same as last year’s—Influenza A (H3N2). Currently, flu is widespread in 45 states, responsible for 7.1% of all outpatient visits to doctors’ offices, urgent care centers, and ERs. If the current trends hold, this will be the worst flu season since the 2009 swine flu epidemic (H1N1), but nowhere nearly as widespread or deadly as the 1918 pandemic that killed more than 50 million people worldwide. Flu still poses the biggest risk in the elderly, where hospitalization in patients older than 65 occurs at a rate 8-fold higher than for young children ages 0 to 4. The hospitalization rate for average adults is even lower than for young children. With the above in mind, I’ll follow with an analogy comparing flu to a car accident. Consider safe driving practices like wearing a seat belt, driving the speed limit, and taking driver safety courses as ways to protect yourself, similar to getting vaccinated, avoiding crowded areas, frequent hand-washing, and covering up when coughing as means to protect yourself and others against flu. Despite defensive driving, however, many people will still get into an accident this year just as many will still get flu despite getting the vaccine. But just as the vast majority of car accidents will be simple fender-benders, the majority of flu cases will be mild. Recovery from both will occur quickly without long-term repercussions. Then, there are the more serious car accidents that require hospitalization, just as there are more serious cases of flu, but even here, the vast majority can expect to recover. Overall, the chances of any given car accident resulting in a fatality are very small, on the order of 0.67%, and the likelihood of flu causing death are even smaller (exact statistics are unknown because many cases of flu are treated at home and never diagnosed, while other infections labeled as “flu” are caused by other, non-influenza viruses). In roughly 40% of fatal car accidents, the victim isn’t wearing a seat belt. Consider these deaths akin to flu deaths in people who haven’t been vaccinated. And just as it’s possible that a seat belt won’t prevent your dying in a car accident, vaccination won’t necessarily prevent your dying from the flu either, but it will considerably lower the odds. Finally, let’s consider the case of a drunk driver broad-siding a car at 60 mph on a sunny, Tuesday afternoon. This is what it’s like when flu kills a previously healthy, young person. There is little you can do to protect yourself against such an occurrence, but also little likelihood that it’s going to happen in the first place. Just as most people don’t worry overly much about dying in a car accident, you shouldn’t worry much about dying from flu. The former is more likely than the latter, and both are rare. Consider the 2014-15 flu season (the most recent year for which data is available). During that year, there were 148 influenza deaths in children. 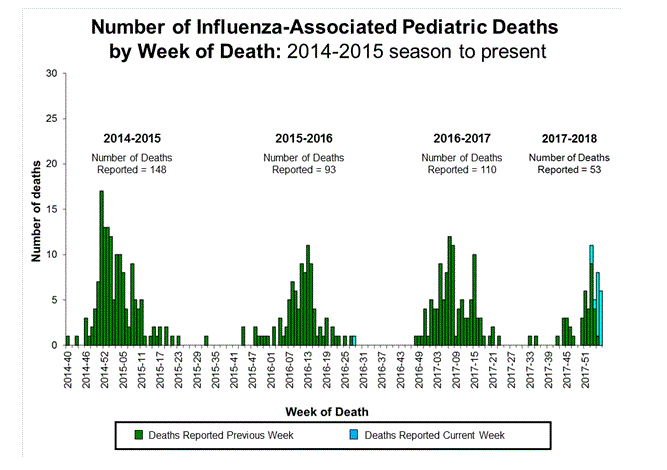 Meanwhile, during that same year, there were 663 motor vehicle fatalities in US children younger than age 12, meaning that children are at least 4-times more likely to die in a car crash than they are from flu. Take precautions but don’t worry. So, why do some young, previously-healthy, people die from flu anyway? It primarily has to do with individual immunity. I can’t tell you how many times some young person has responded to my query on vaccination with the following: “I never get the vaccine. I have a strong immune system.” Sorry, but that “strong immune system” is the most likely thing to get you killed if you do happen to catch flu. In the worldwide pandemic of the last century, it was predominately the young and healthy who succumbed, often within 24-hours of becoming ill. Whereas elderly patients more often die from secondary complications of flu like bacterial pneumonia, in young people, it’s more often their wonderfully, healthy immune systems that do them in. By responding with a tsunami of white blood cells, antibodies, and chemical cytokines, the lungs can literally become flooded with mucus, making gas exchange near impossible while also predisposing to a host of secondary bacterial invaders. Once the body’s respiratory tract defenses have been breached, the floodgates are open to widespread systemic infection and an overwhelming viremia that can result in multiple organ systems failing simultaneously. When that occurs, death follows almost inevitably. If this happens to you, then you’ve won the unlucky lottery. Although vaccination may not prevent catching flu, it likely will prevent the overwhelming cytokine response that occurs in some young healthy people when confronted with a novel virus by exposing them beforehand to an inactive strain of it. Once vaccinated, if you do catch flu, chances are that it will be a less severe case than if you hadn’t received the vaccine. There are no contraindications to receiving the standard trivalent vaccine for people older than age 6-months, other than a history of a prior severe allergic reaction to the vaccine. It is safe during pregnancy. A 2012 review that included 4,172 egg-allergic patients found no occurrences of anaphylaxis following the administration of the vaccine (although some mild reactions did occur), suggesting that severe allergic reactions to egg-based vaccines are unlikely, even in egg-allergic patients. Based on this, egg allergy is no longer considered a contraindication to receiving the vaccine, although the CDC recommends that vaccination of such patients occur under direct physician supervision (i.e. not in a “minute clinic” or pharmacy). Lastly, although this should be common knowledge, I feel compelled to add that you can’t catch flu from the vaccine although your arm may get sore and you may feel achy for a day afterward. For more on the different types of flu vaccines, see the CDC website (https://www.cdc.gov/flu/index.htm). I hope this assuages some of the fear surrounding the disease. No one wants to get flu, but if you do, you’ll likely recover with no more than a week of misery. Take a fever-reducer, drink plenty of fluids, and stay home. This flu seems to be causing a lot of people to faint. If this happens, it’s reasonable to get checked out. I’ve already seen several such patients, and although they weren’t seriously ill, they benefitted from a couple bags of IV saline. You should also be seen if your pulse is rapid, you have intractable vomiting (another thing this flu strain is capable of causing), or shortness of breath at rest. Do not attempt to “work through” flu. Running yourself down will only make you sicker and keep you that way longer. Headache and fever don’t warrant a trip to the doctor unless the headache is unrelenting and associated with a stiff neck (signs of meningitis). All flu-related fever responds to appropriate doses of antipyretic medication such as Tylenol, Motrin, or Aleve. Take your pick and don’t fret if the fever recurs 4 to 5 hours later or if the fever reduction is incomplete—both are common with flu. Fever is your body’s way of advising you that you’re sick. Pay attention. Rest. Sleep. Your immune system is working as intended. Flu is bad news resulting in between 140,000 to 710,000 annual hospitalizations and 12,000 to 56,000 US deaths (depending on the virulence of the particular prevalent strain), with average annual direct medical costs of $10.4 billion and another projected loss of $15 billion in 2018 due to missed work days and lost productivity. Vaccination is the best protective, but what should you do if you get sick anyway? How do you know if it’s flu (influenza) or just a simple cold/URI (upper respiratory infection)? Both are viral. Both cause congestion, sore throat, cough, fever, malaise, and headache. Both are spread primarily through coughing and sneezing. The difference is one of degree. Flu is like a cold on steroids. There are three clinical characteristics that help distinguish flu from a cold: 1) Rapidity of onset. Flu strikes all at once over hours, not days as in the case of a cold; 2) Fever. Colds generally cause low-grade fevers to 100-101 F, while flu typically results in much higher fevers on the order of 102-104 F; 3) Muscle aches, joint pain, and headache. These are the sin qua non of influenza. If you don’t feel like someone beat you with a stick then it’s probably not flu. If you think you have it, should you shell out $145 dollars (average ER charge) for a flu test? Although accurate when positive, most nasal-swab, rapid-result tests are inaccurate when negative (25-30% false negative rate, meaning that you have the disease when the test says you don’t). Here’s what the CDC has to say on the matter: “Confirmation of influenza virus infection by diagnostic testing is not required for decisions to prescribe antiviral medication. Decision-making should be based upon signs and symptoms consistent with influenza illness and epidemiologic factors.” In other words, if flu is rampant where you live, treat-and-street with no testing. But if you go to an urgent care center they’ll likely recommend it, if for nothing else other than to limit their liability and pad your bill. There are a few exceptions: it’s reasonable to test hospitalized patients, immunocompromised folks, and sick looking infants, but once a flu outbreak is established, treatment should be symptom-based, not test-based. It should ease symptoms and shorten their duration. It should reduce complications and mortality. It should be effective at any time during the course of the illness. It should prevent the illness from spreading to others. It should have few side-effects. It shouldn’t cost a lot. Tamiflu fails on all counts. When it comes to easing symptoms and shortening their duration, Tamiflu’s a bust. A Cochrane Collaborative review of multiple studies noted that Tamiflu shortened the duration of flu symptoms by a pithy 16.7 hours, likely the same reduction you’d get from simply taking Tylenol and drinking plenty of fluids. Nor does the drug reduce complications like chest x-ray proven pneumonia, the need for hospitalization, or flu mortality. So where did former-CDC Director, Thomas Frieden, get off telling a National Public Radio audience in January of 2015 that Tamiflu “might keep you out of the hospital and could even save your life” before adding that if he or one of his family members became ill with flu he would get them “treated with Tamiflu as quickly as possible”? The statements seem irresponsible considering that the FDA had previously come to the opposite conclusion after reviewing the manufacturer’s own trial data. As it turns out, Roche (makers of Tamiflu) had donated nearly $200,000 to the CDC Foundation to “support research into influenza prevention and treatment messaging.” Quid pro quo? Nor am I swayed by the 2015 meta-analysis touting Tamiflu’s supposed benefit in reducing hospitalizations and complications. In this study, the benefit all but disappeared in the intention-to-treat population (i.e. the one the CDC says we’re supposed to treat that includes not just flu-positive cases, but also those empirically treated based on symptoms alone). When a study smells funny, there’s usually a drug company sponsor lurking in the shadows as there was in this case, with 3 of 4 authors having financial ties to Roche. Does Tamiflu work at any time during the illness? Here the answer is a clear “No.” The benefit only occurs when the drug is administered early, preferably within 24 hours. After 48 hours of symptoms, the drug’s benefit—if any—disappears. But this doesn’t mean that you should go running to the doctor at the first sniffle because the very best place to catch flu is in an ER waiting room. If you don’t have flu going in, you might well have it coming out. Masks and hand sanitizer help prevent transmission, but only to a point. Does taking Tamiflu prevent flu transmission to others? The data here suggests that you need to treat between 7 to 11 flu patients in order to prevent one household contact from contracting the illness. Might be worth it if you live with a sick grandmother, a newborn infant, or a family member on chemo. Otherwise, not so much. Is Tamiflu free of side effects? Not hardly. It causes headache in 15%, vomiting in 5%, and diarrhea in 7% of people who take it. Rare psychological side-effects including anxiety, psychosis, and suicidal ideation have been associated with the drug, although there are no studies demonstrating causation. On February 1, 2018, a CBS News story aired wherein the bereaved parents of a 16-year old suicide victim blamed their son’s death on Tamiflu. Damned if you do; damned if you don’t. Then there’s the matter of cost. The average retail price for a 5-day course of Tamiflu runs about $140 dollars (Feb 2018 price), although with a GoodRx coupon you can get it at select pharmacies for less than half that. Worth it to get better less than one day sooner? Make up your own mind about that one. People with COPD, heart disease, diabetes, chronic renal failure, or other serious diseases. Immunosuppressed patients on chemo or those with HIV. Pregnant women and post-partum women up to 2 weeks after delivery. People under 19 on long-term aspirin therapy. People with morbid obesity (BMI greater than 40). Nursing home and chronic care facility residents. Note that the CDC doesn’t recommend treating everyone. If you’re 40 and healthy with 3 days of symptoms—no Tamiflu. But go to a doctor’s office, urgent care, or ER with flu and you’ll likely get it. When jobs depend on patient satisfaction surveys, patients will be treated. Famed surgeon, Sir William Osler once quipped: “The desire to take medicine is perhaps the greatest feature which distinguishes man from animals.” I get it. When you feel crappy, you want your doctor to do something for you that you couldn’t have done for yourself. And when it comes to flu, that “something” is a prescription for Tamiflu. But now that you know the truth, maybe just stay home. After all, that’s the best way to prevent spreading flu to others, including the many nurses and doctors standing at the ready to help you when you really need it. A. Des Roches et al., “Egg-Allergic Patients Can be Safely Vaccinated Against Influenza,” J Clin Immunol 2012; 130: 1213-6e1. Jefferson Jones et al., “Neuraminidase Inhibitors for Preventing and Treating Influenza in Adults and Children (Review),” The Cochrane Collaboration 2015, Wiley & Sons, Ltd.
Joanna Dobson et al., “Oseltamivir Treatment for Influenza in Adults: A Meta-Analysis of Randomized Controlled Trials,” Lancet 2015; 385: 1729-37. This entry was posted in Uncategorized and tagged flu, influenza, Tamiflu. Bookmark the permalink. ← The Buzz: Update on the Recent Medical Literature (part 1).